Cast: Angela Bassett, Harland Williams, Laurie Metcalf, Tom Kenny, Adam West, Tom Selleck. Directed by Stephen J Anderson. Story: Inventor orphan kid goes to the future. I don't know. 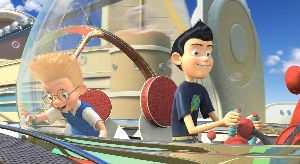 Meet The Robinsons is getting a bit of a kicking in some quarters, but I thoroughly enjoyed it. Maybe I'd better check my birth certificate and make sure I'm not twelve. It's certainly not your regular big-budget, star-encrusted animus opus (which doesn't mean what I want it to, but you get the idea). The names in the cast are C-list at best, most of them being almost totally unfamiliar to Brits, though casting Adam West (the original-original Batman) is a masterstroke. The quality of the animation isn't up to the class-leaders, however the observational character movements are superb and it's easily warm and pleasing enough for kids. 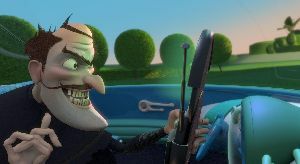 In a strange way it looks like stop-motion animation (like Corpse Bride), but with the freedom you only get with complete computer-generation. Although it's primarily a kids' movie, there's enough for adults too, with one or two gags that will go straight over the kids' heads. The story is usual kiddie-fare nonsense - a prodigiously talented inventor-orphan goes to the future and meets the motley Robinsons who ... well it doesn't matter. What matters is the overriding feel of the movie, which for me was one of energetic fun and cute characterisations. True, there are a LOT of characters, which can become overwhelming at times - in fact I haven't a clue who most of them were - but they're all fun to watch and as a result the rather long 1h40 running time simply zooms by. The dialogue is funny and the voiceovers are excellent - even the young'uns, which are usually a sticking point. I'm not entirely sure why it's not getting more positive reviews - it seems to be polarising opinion, with pretty much everyone either loving or hating it. Happily, I'm still not bored with animations despite having seen about a bazillion of them, and it gets the full thumbs-up from me. Meet The Robinsons is an encouraging sign of Disney work to come. It's significantly better than their first outing Chicken Little and I'd have no hesitation showing it to my kids. If I had any. Meet The Robinsons was released in the UK on 30th March 2007.